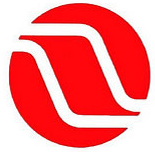 24 November 1971: Early Wednesday afternoon, a man who gave the name “Dan Cooper” purchased a one-way ticket for Northwest Orient Airlines Flight 305, a non-stop flight from Portland, Oregon, to Seattle, Washington. Flight 305 departed on schedule at 2:50 p.m., PST, with a crew of 6 and 37 passengers, including Cooper. Captain William A. Scott was in command with First Officer William Rataczack as co-pilot and Second Officer Harold E. Anderson, flight engineer. 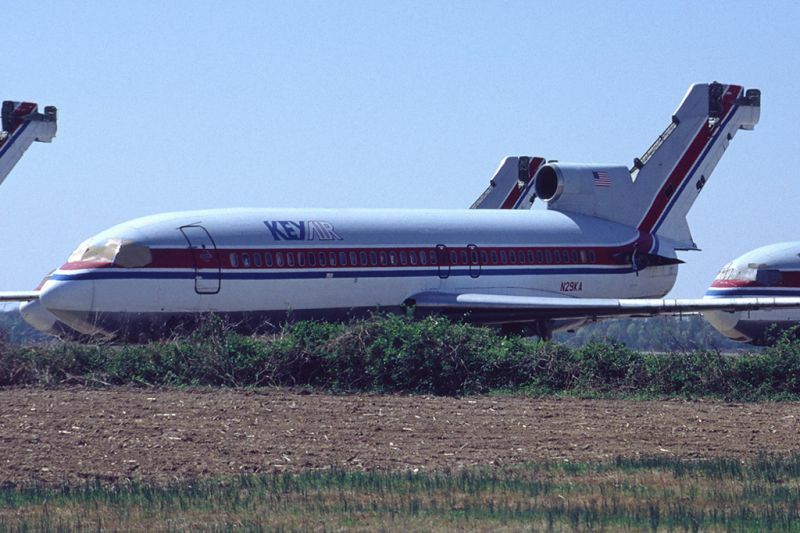 The airliner was a six-year-old Boeing 727-51, c/n 18803, registered N467US. On this flight, it was approximately one-third full. The trip from PDX to SEA was estimated to take 30 minutes. Shortly after takeoff, Cooper gave a handwritten note to Florence Schaffner, a flight attendant who was seated nearby. The note read that the airliner was being hijacked and that Cooper had a bomb in his briefcase. Schaffner asked Cooper to show her the bomb. He opened the brief case and she later described having seen eight red cylinders with red-insulated wires attached, and a cylindrical battery. 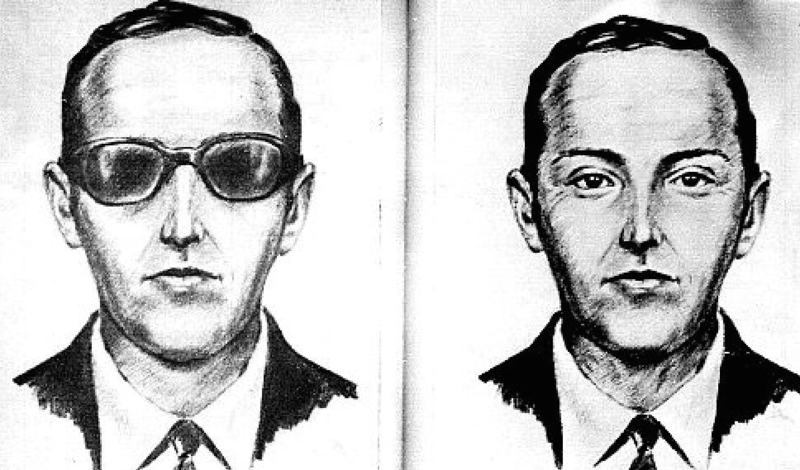 Cooper closed his briefcase and gave Schaffner his demands: $200,000 in United States currency, four parachutes and a fuel truck to be standing by on their arrival at Seattle. She then relayed Cooper’s demands to the flight crew. Once over Seattle, Flight 305 circled for approximately two hours while officials on the ground arranged to comply with Cooper’s demands. 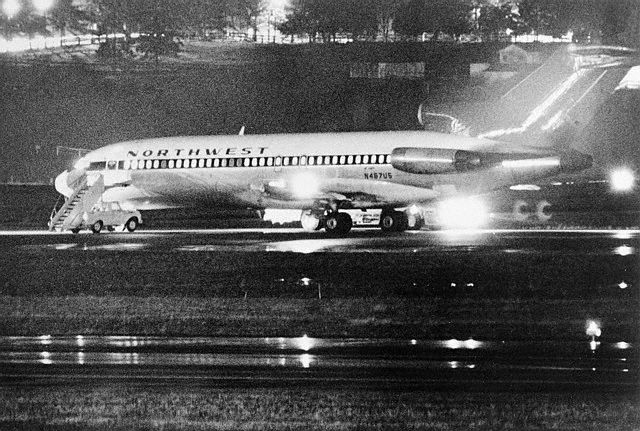 The 727 landed at SEA at 5:39 p.m. Ransom money had been gathered by the FBI from several Seattle area banks and consisted of 10,000 $20 bills. The notes were not marked but all were photographed to record their serial numbers. The money was carried to the airliner by a Northwest employee, along with the requested parachutes. These were given to flight attendant Tina Mucklow at the 727’s aft boarding stairs. She carried these to Cooper, who satisfied that his demands had been met, allowed the 36 other passengers, as well as flight attendants Schaffner and Alice Hancock, to leave the airplane. Refueling was delayed because of trouble with the fuel truck, and eventually three trucks were used. Cooper informed the flight crew that he wanted them to fly the 727 south to Mexico, and gave very specific instructions. He told them to fly as slow as possible, to leave the landing gear extended, flaps lowered to 15°, and to remain below 10,000 feet (3,048 meters) with the cabin unpressurized. He also demanded that the airliner takeoff with its ventral stairs lowered but this was refused as being unsafe. 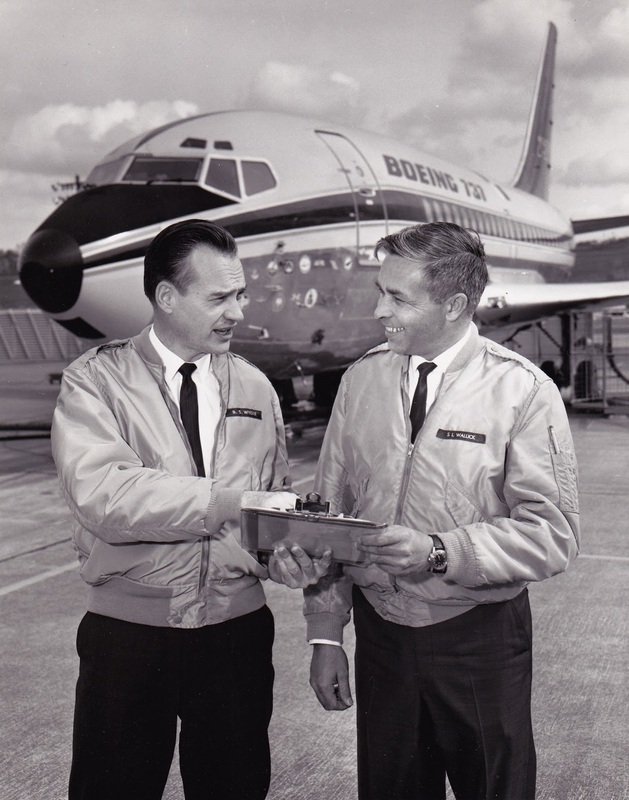 At 7:40 p.m., N467US took off from SeaTac with the flight crew and cabin attendant Mucklow still on board. Cooper required that Mucklow remain with him in the passenger cabin. It was followed by two Convair F-106 Delta Dart interceptors from McChord Air Force Base. An intermediate fuel stop had been planned for Reno, Nevada, and the airliner headed in that direction, flying along a standard airway, Victor 23.
Cooper told Mucklow to go forward and join the rest of the crew in the cockpit. At 8:00 p.m., a warning light in the cockpit came on indicating that the ventral stairs had been activated. At 8:13 p.m., the aircraft pitched nose down, and required that the flight controls be re-trimmed for a level attitude. At 10:15 p.m., the airliner landed at Reno. After a search, it was determined that Cooper, the money and two parachutes were no longer aboard. Flight 305 crew at Reno, Nevada. 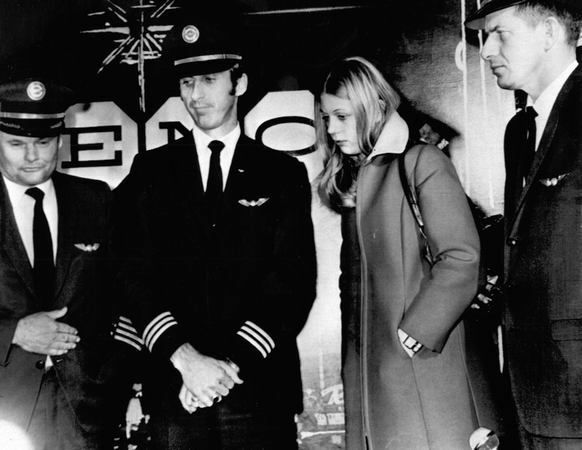 Captain William A. Scott, First Officer William Rataczack, Flight Attendant Tina Mucklow, and Second Officer Harold E. Anderson. 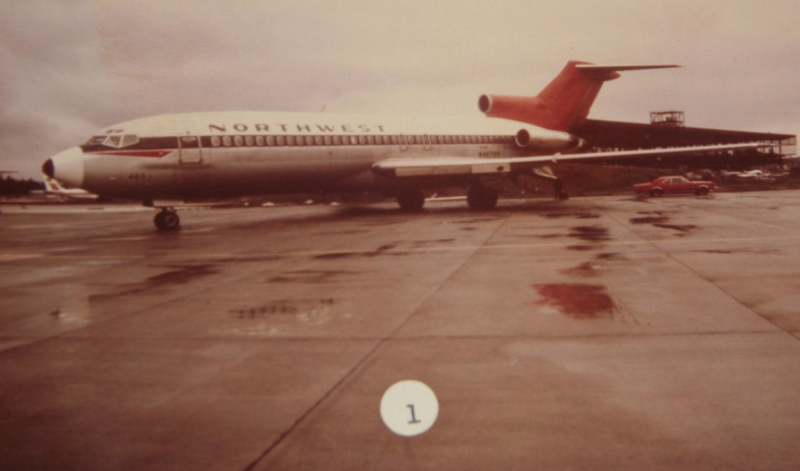 In 1978, a hunter discovered a placard from a 727’s aft stairs near the known path of the hijacked 727. In 1980, a young boy found three deteriorated packets containing $5,800 in $20 bills along the banks of the Columbia River, downstream from Vancouver, Washington. The serial numbers matched currency included in the ransom. Dan Cooper has never been located. There have been a number of persons considered as suspects, however it is possible that Cooper did not survive the jump from Flight 305. 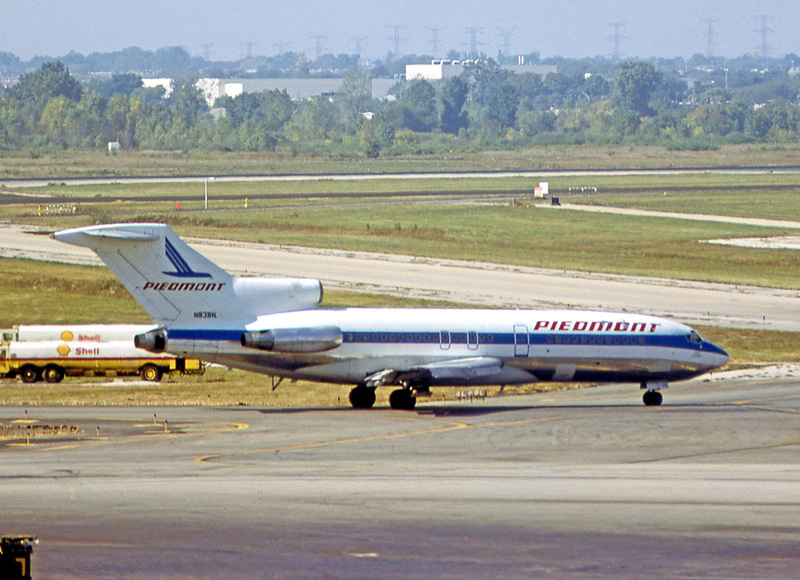 N467US remained in service with Northwest Orient Airlines until June 1978, when it was sold to Piedmont Airlines, re-registered N838N, and christened Mt. Mitchell Pacemaker. 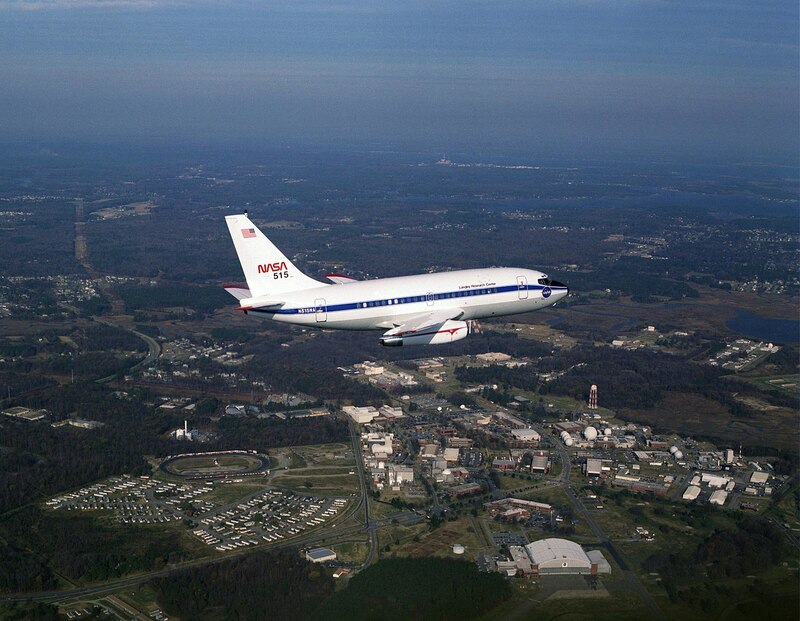 From 1982 through 1984, it was operated by United Technologies Flight Dynamics, testing navigational equipment. In September 1984 the 727 was again sold, this time to Key Airlines, with a third registration N29KA. During this period, c/n 18803 was operated on daily charter flights from Nellis Air Force Base to the Tonapah Test Range, a restricted Department of Energy installation located about 125 nautical miles (144 statute miles/232 kilometers) northwest of Las Vegas, Nevada. Later, the 727 was placed in storage at Greenwood-Leflore Airport (GWO) near Greenwood, Mississippi. It was scrapped in 1996. C/n 18803, a Boeing 727-51, is now considered to be a 727-100, a medium-range civil transport. It was operated by a flight crew of three and could carry up to 131 passengers. The airliner was 133 feet, 2 inches (40.589 meters) long with a wingspan of 108 feet, 0 inches (32.918 meters), and overall height of 34 feet, 0 inches (10.363 meters). Empty weight was 87,696 pounds (39,778 kilograms) and maximum ramp weight was 170,000 pounds (77,111 kilograms). Usable fuel capacity was 8,090 gallons (30,624 liters). 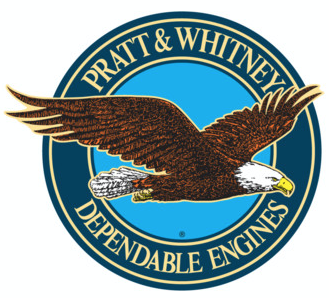 Power was supplied by three Pratt & Whitney JT8D-7 turbofan engines. The JT8D-7 was a two-spool engine with a 2-stage fan section, 13-stage compressor (6 low- and 7 high-pressure stages), nine combustion chambers, and a 4-stage turbine (1 high- and 3 low-pressure stages). The JT8D-7 had a maximum continuous power rating of 12,600 pounds of thrust (56.048 kilonewtons) at Sea Level, and 14,000 pounds (62.275 kilonewtons) for takeoff. It was 3 feet, 6.5 inches (1.080 meters) in diameter, 10 feet, 3.5 inches (3.137 meters) long, and weighed 3,096 pounds (1,404 kilograms). Two of the engines were in nacelles at either side of the aft fuselage, and the third was mounted in the tail. Its intake was above the rear fuselage at the base of the vertical fin. 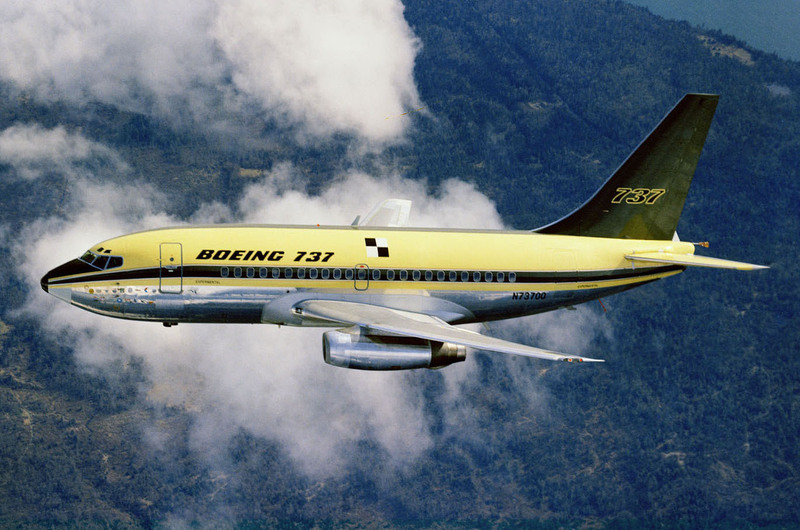 The Boeing 727s were very fast airliners with a maximum speed in level flight of 549 knots (632 miles per hour/1,017 kilometers per hour). The Design Cruise Speed (VC) was 530 knots (610 miles per hour/981 kilometers per hour) at 25,000 feet (0.88 Mach). The airplane was certified with a Maximum Mach Number (MMO) of 0.92 Mach (this was later reduced to 0.90 Mach). 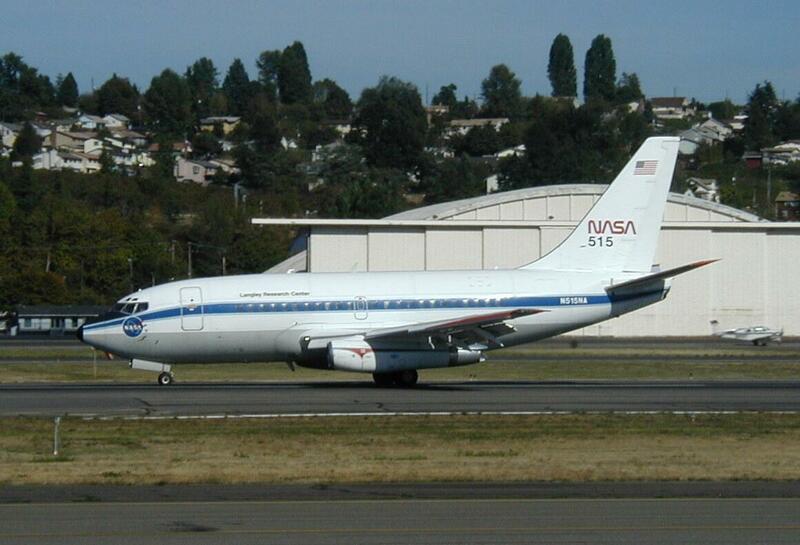 (During flight testing, a Boeing 727 achieved 0.965 Mach in level flight.) The airliner’s service ceiling was 37,400 feet (11,400 meters) and the range was 2,600 nautical miles (2,992 statute miles/4,815 kilometers). 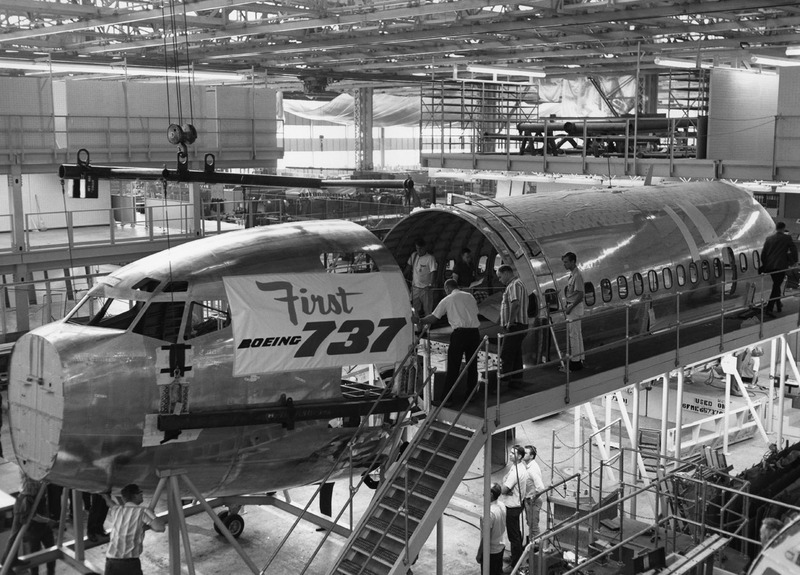 Boeing built 572 of the 727-100 series and 1,260 of the longer 727-200 variant from 1963 to 1984.